Others who write on this suggest that truth is not ascertainable, that is, we cannot know what is true even if a perfect, impartial marketplace of ideas existed. That may be true in a philosophical or existential sense, but in more practical matters such as engineering and hard science, truth is not nearly so elusive. To put it bluntly, "We've seen it done, son." As one with more than 40 years hard experience in chemical engineering, I for certain have seen the truth in engineering. And, since much of engineering is based on hard science, there is much truth there, too. As just a brief excursion, my engineering experience thus far has encompassed more than 75 oil refineries, chemical plants, and petrochemical plants located around the world. The countries with those plants range from the far north of Canada to southern Brazil, and China to Poland. The simple truth is, those process plants all behaved as engineers expect them to behave, because the truth is known about the chemistry, physics, mathematics, economics, and engineering that are used to design, build, and operate those plants. In short, my discipline has the version of truth that holds, truth is "a mathematical model that adequately predicts future results." And, that is precisely what we have in chemical engineering: e.g. a model that predicts a pipe of a certain diameter, made of a certain type of steel, and with a certain wall thickness, will not only keep the fluid inside at the specified temperature and pressure, but will also allow the specified volumetric flow rate to occur with a predicted decrease in pressure (pressure drop) as the fluid moves through the pipe. We have thousands of similar truth-telling models, for chemical reactor design, distillation tower design, fired heaters, heat exchangers between fluids, pumps, compressors, control systems, water cooling towers, flare gas systems, and a multitude of other items in the process plants. We can examine several sources of error for truth for engineering, and for climate science. Among those sources of error would be access to the marketplace of ideas, bias in evaluating ideas in the marketplace, and importantly, consequences of failure to eliminate false ideas. A more insidious source of error is the failure to understand, then critically examine the basis for each published paper. What is worse, is a full understanding of what constitutes good science, but deliberate acceptance of erroneous data and calculations to further an agenda. The previous article on SLB discussed access to the marketplace of ideas. In science as well as engineering, there are only a few reputable sources where publications are made. These disciplines are not like the political arena, where literally thousands of arenas exist where politics are discussed. Instead, there are a few journals and a few more technical or scientific societies that publish or present papers at their meetings. A journal has an editor and editorial board that may accept or reject a paper for publication, simply based on its content or conclusions. In some sense, that is acceptable, because crack-pots should not be given access to publish demonstrably false material. Here, the false material would include perpetual motion machines, and the famous (but fictional) automobile carburetor that achieves 200 miles per gallon. In climate science, there are concerted efforts to keep out papers with data and conclusions that show there is no cause for alarm from the Carbon Dioxide (CO2) that is released by burning fossil fuels. This is an example of bias in evaluating ideas. There may be bias due to agendas rather than a desire for the truth. The old saying of 'The ends justifies the means' may be at play. It may be that bias is due to editors who fervently believe the Earth is in imminent danger of overheating and melting the polar ice caps. That brings up the source of bias mentioned above: editors and peer-reviewers that have a full understanding of what constitutes good science, but deliberately accept erroneous data and calculations to further an agenda. This blog will have much more to say about this. For today, it is simply noted that the global temperature record has within the database hundreds and thousands of temperature measurements from locations such as cities, where increased temperatures over the decades are due entirely to factors other than CO2 increases in the atmosphere. see link to SLB article on non-CO2 causes of warming. Another issue is accepting and publishing papers with data that has end-point problems, where the average trend over time is grossly influenced by a few data points at each end of the plotted data. This blog has several articles on this, with the phrase "Abilene Effect." In summary, three very cold winters in 1977, 78, and 79 gave the false impression of a warming trend from 1975 to 2000. That also included a fortuitous El Nino year in 1998, that produced a temporary upward spike in the temperature record. The combination of low temperatures around 1979, and a high temperature in 1998 gave a false warming trend over that time period. It must be emphasized that the warmists in the climate science community frequently insist that the warming in the latter part of the 20th century (1975-2000) is unprecedented; and they (falsely) link that to an increase in CO2 in the atmosphere. see link to SLB article on the Abilene Effect, and Figure 1 nearby. Note that the cold winters near 1980, and hot year in 1998 occurred in almost every location in the US. Consequences of failure to eliminate false ideas. What happens in engineering when false ideas are not screened out but are placed into the practice of engineering? In many cases, the engineered process or item fails, with economic loss or harm to humans. Sometimes, the harm includes death. In other cases, there may be enormous devastation, such as from a dam's failure. Engineering typically has serious consequences when bad ideas are not identified. Engineers are held accountable in the courts and by licensing boards for their failures. One notable, and very recent, example is the engineering fiasco in the design and construction of the twin-reactor nuclear power plant in South Carolina at the V.C. Summer site. There, billions of dollars have been spent over a few years in the construction of a nuclear power plant. However, numerous errors resulted in the project being halted and abandoned. Government and private attorneys are sorting out the mess over who did what, and who owes how much to whom. In contrast, climate science has, to this point in time, very little adverse consequences for advancing false ideas. In fact, there are claims that climate scientists actually benefit from adhering to the false dogma. Publish or perish is certainly true for scientists, and if one can only publish papers based on data that furthers the agenda, then that is what is written for publication. There have been several scientists who have published, somehow, contrary data and suffered career-damaging results. The false-alarmists in climate science have a long horizon, they say, before real damage occurs. This is not at all like engineering, where we start up a process plant within 2 or 3 years from start of construction. If the plant fails, we know about it right away. Climate science predicts calamity 50 to 100 years in the future. What can be done about the false ideas from climate science? The best antidote to bad speech is more speech, to paraphrase a court opinion. What is needed is more debate, more clear and convincing proof that the warmist climate science is based on bad data, has bad statistics, and demonstrably erroneous conclusions. 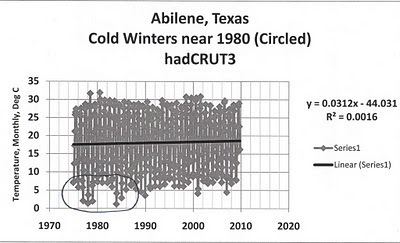 The Abilene Effect above is merely one of the many false ideas put forth by the warmist climate camp. There are others, which will be written on soon on SLB. For a preview, one can simply consider the implications of claimed sealevel rise in a few locations that should have resulted in beaches being underwater by many feet by this time. None of those beaches are underwater. For another instance, one can consider the Arctic sea ice concentration results for the past 12 years - no decline but instead a slight increase in trend over time.